Wrong #1 is to label the Likud and Prime Minister Binyamin "Bibi" Netanyahu as promoting Right wing policies. Wrong #2 are their policies. At times, like when campaigning or for the right media effect, they talk the talk. But push comes to shove, once the cameras are down and it comes to real policy, not theoretical, they don't walk the walk. In old cowboy and indian movies, they'd be described as having "forked tongues." After just too many years of Likud-led coalition, I'd say that all the Likud MKs and ministers are the same. None have quit in disgust; their obvious ambition overrides their supposed principles. Coalition partner Yvette-Avigdor Lieberman may try to give the impression of being a tough fighter, but the only thing he really fights for is his own personal power. Some of his policy statements/proposals are even worse than Bibi's. Unfortunately, the Jewish Home, formerly NRP, is proving itself more Yosef Burg, than the principled patriotic pro-Jewish Rights and Sovereignty in the Land of Israel that most of its voters had been hoping for. The wily Bibi Netanyahu made his coalition partners sign a contract that was more reminiscent of Dorian Gray than what their voters had voted for. The backtracking on security cameras for Arab Muslims is embarrassingly outrageous. Simple logic, where's the common sense? The previous policy which policed and inspected everyone but Arab Muslims entering and wandering around the Temple Mount was inexcusable. I'm sure that all of the police and soldiers and their loved ones stationed on the Temple Mount were relieved once those metal detectors were in use. But within a couple of days, Bibi folded, melted showed the world and the Arab terrorists that he does not care about the security of the State of Israel. Each time something like this has happened, many of us expect, or pray, that the coalition will break up and that we'll see politicians with principles. I guess that "politicians with principles" is an oxymoron. Gd willing, there will be a miracle, and we'll finally have a true, reliable Jewish Leader who fears nobody but Gd Almighty. Gd willing, there will be a miracle, and we'll finally have a leader who will impose fully Israeli Sovereignty over the Entire Land of Israel. That is the only way we will achieve PEACE. 9th of Av Yet Again is also cross-posted on Israel Blogger. "I'm perfect. He's the one who got us into trouble." Déjà vu. It's happening yet again. We have a government that runs to foreign leaders for "advice" and "aid" rather than doing what is best for the Jewish People and State of Israel. Our government treats foreign values as gods instead of obeying the One and Only Gd Almighty. Our government worries about world opinion instead of what's best for us. I dread checking the news. It's hard to keep in mind that there is a way out of this dangerous mess. We don't have to wait for the Month of Elul to repent. Teshuva, Repentance is accepted by Gd all year long. Israel's Security Solution, Clear and Timeless is cross-posted on Israel Blogger. Dvarim 3:22Do not fear them, for it is the Lord, your God, Who is fighting for you." This may sound simplistic and unrealistic to some, but having lived through the 1967 Six Days War, even though in New York, I could easily see that the IDF was just a tool in Gd's hands. In May, 1967, Egypt began threatening Israel with annihilation. Egypt demanded that the United Nations remove its peacekeeping forces from the Suez Canal. the UN quickly buckled and removed its peacekeeping forces. While Egypt had no problem gather allies and support, the State of Israel was left alone. 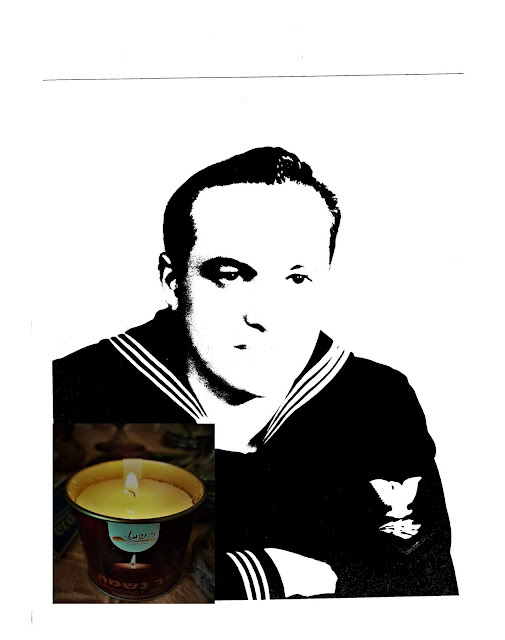 Support came from prayers to Gd from Jews and others all over the world. Simply put, the only goal that the State of Israel had as it prepared to fight was to survive. The government had hoped that our destroying enemy air forces would end the war without the need for troops on the ground, since the Arabs had more than we did. In the fifty years since the war, many military experts have tried to analyze it. Even then, in 1967, people were incredulous. We could only credit the Hand of Gd. The conclusion of the international experts is the same. The victory, including the straightening and expansion of Israel's borders had to have been a miracle. There is no other way to explain it. The State of Israel must stop trying to get foreign support and allies, because our survival is dependent on our belief in Gd. We do have to make our military efforts, but the victories aren't ours alone. It's not the IDF that should get all the credit. These are gifts from Gd Almighty. No foreign country will protect us the way Gd does. Today is no different from when King David, as a young man, told the then ruling King Saul that he will defeat Goliath with the help of Gd, not with conventional modern weapons of the time. David didn't stand around waiting for Gd to kill Goliath. He found simple stones and aimed perfectly, and then Gd did the rest. This is cross-posted on Israel Blogger. 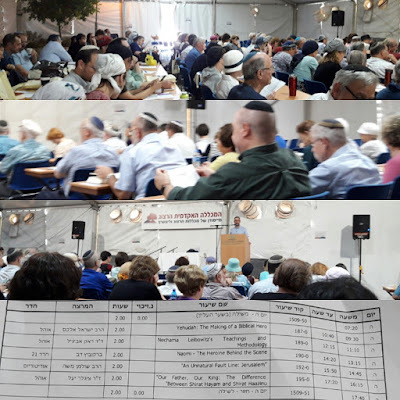 Yesterday, along with hundreds or most probably thousands of others, I spent the whole day learning Tanach, Bible at Michlelet Herzog in Alon Shvut. 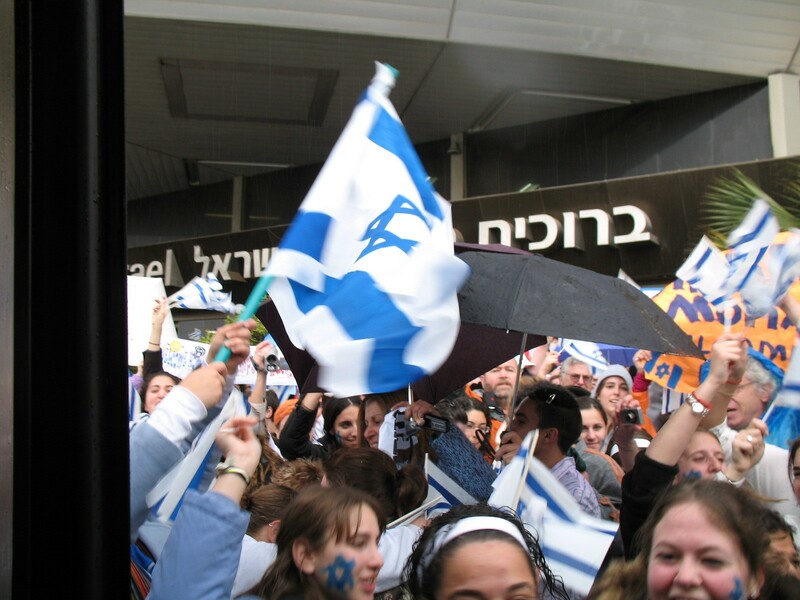 People came from all over Israel to attend, and classes were in two languages, Hebrew and English. Considering the amount of English heard in the hallways, WC and cafeteria, I'd say that many English speakers attended classes in Hebrew. There was an amazing range of choices in lectures, and most people had preregistered, so the organizers knew in which sized rooms the lectures should be. Most people also paid for lunch, which was plentiful and efficiently served. And there was also an option to take buses, which even had a stop in Shiloh. Yes, that's how I traveled. I only attended one day of the classes, but I have many friends who were there for more. Considering that there were five scheduled classes in just one day, I'd expect to fade long before the day was over. But thanks to the perfect temperature air-conditioning, spritz humidifiers outdoors, perfectly timed breaks between lessons and the unlimited hot/cold drinks available, I remained awake and alert the entire day. Of the five classes I took, the highlights were Yehuda, "The Making of a Hero" by Rabbi Alex Israel, "An Unnatural Fault Line: Jerusalem," by Rabbi Moshe Shulman, and Dr. Yael Ziegler's "Our Father, Our King: The Difference Between Shirat Hayam and Shirat Haazinu." These were lectures, not discussions, and frequently I had to bite my tongue to keep from trying to dialogue with the speaker. 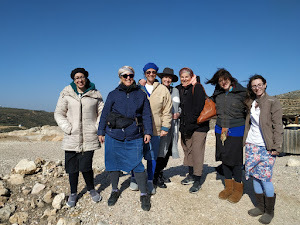 This was much less a problem with Yael Ziegler who is an expert in giving such a complete and brilliantly planned Bible Tanach lesson, which inspires and informs, rather than leaving me with a host of unanswered questions. Rabbi Alex Israel stepped into the usual mistake of presuming modern family modes and values for the time of Yehuda and Tamar. I find that worse than annoying. Marriage in the time of the Bible was not like modern time at all. To me it's very obvious that Tamar's marriage to Yehuda's eldest son, Er, had nothing to do with "love." There was some business or political decision between her clan and Yehuda's. His sons, who as Israel did point out, were most probably too young to understand their role and cooperate by having children with her. But, as I see it, Tamar did understand the importance of having a family with Yehuda's clan, and that's why she took the daring step of disguising herself as a prostitute and seducing Yehuda. Disguises and daring women were very common threads in the David and Messianic line. Think of Ya'akov and Leah. Ya'akov disguised himself as his brother to fool his father to get the main inheritance instead of his brother, and then Leah tricked him, pretending that he was marrying her sister Rachel. These are points I had wanted to mention if it had been "that sort of lecture." But there was no time for questions and dialogues. Rabbi Moshe Shulman's topic was totally new for me. I hadn't thought about the idea that the "political" Yehuda and Yisrael split predated the King Solomon's descendants. Rabbi Shulman used the tribal maps to simplify the geography of the split, which caused me to want to ask what happened to the Tribe of Shimon, Simon, which was in the area of Yehuda. Yes, that's one of my "dumb questions." Besides that, I quickly saw something that the tribes of Yehuda and Binyamin had in common, which Shulman didn't mention at all. It almost reminded me of Korach... Both those tribes had members anointed as kings by Shmuel Hanavi, as instructed by Gd. Actually, I was disappointed that Shulman didn't mention it. The rivalry between the sons of Rachel and Leah is depicted many times in the Bible, but here we see them united against the sons of the concubines and their other brothers. I really like it when a Bible lecture inspires me to ask lots of questions, but when it's not a framework that allows discussion, at least I have my blog, and I will send them this link. Bli neder, can't promise, I will post answers if I receive them. All lectures should be on the Herzog site at some point. 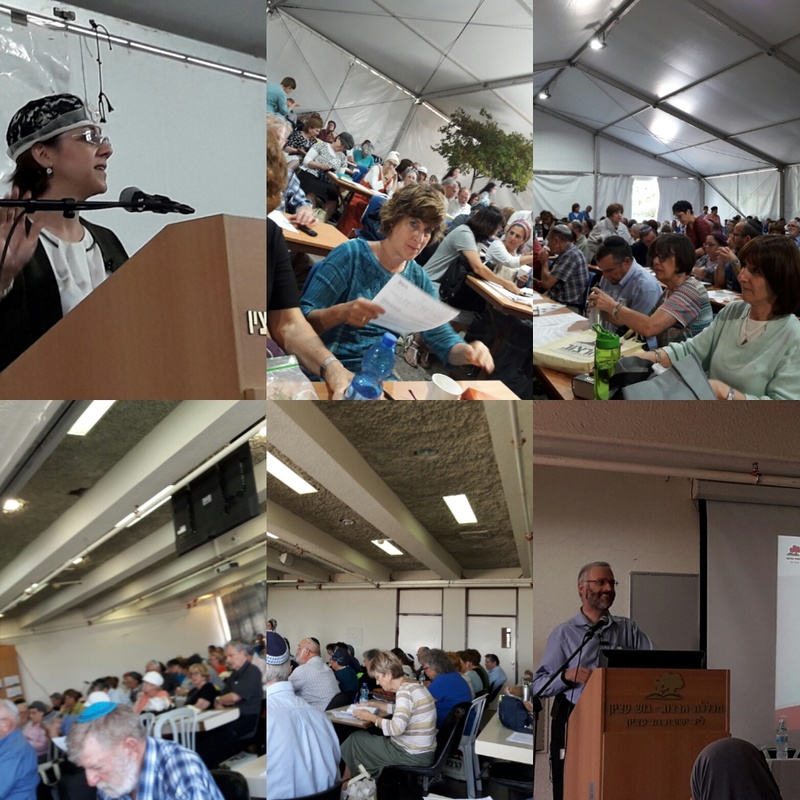 For anyone who understands Hebrew and has an interest in Biblical History, the Land of Israel and archaeology, the annual Shiloh Conference, Kenes Shiloh is something you really must attend. It includes a tour of the site, updates on recent discoveries from the numerous digs going on simultaneously in the area of Shiloh and other interesting lectures. There are two routes to the tours. One is for people who either have never been to Shiloh Hakeduma, Tel Shiloh, before or haven't been on a tour in recent years. It includes the short movie about Biblical Shiloh. The other tour is for those of us who are more up to date and stresses the newest discoveries. All of the tour guides are excellent and very interesting. My only complaint is that it all starts too late and not only is rushed, but it's over later than most people can handle. I suggest that they start it at 3pm with the first greetings and talks. Then the tour, which would have a third option, a virtual tour. It would be for those who can't walk around the site. There would be an hourlong lecture with pictures and combine the two tours in that it would have basic stuff plus news of the latest discoveries. And then after a break for "dinner"and "shopping" in the "souvenir shop," there would be the final lectures. In recent months there have been many new discoveries at the Tel, not only the usual coins and pottery, but when working at the eastern city wall a large amount of jugs were found. And as has been discovered in the past, apparently, Shiloh remained an inhabited city long after Samuel the Prophet left it. 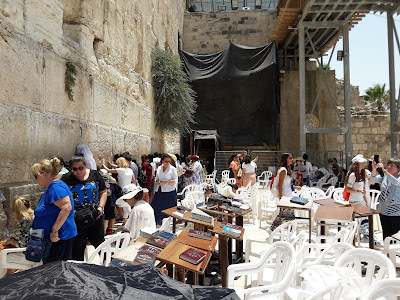 A Guide to The Kotel and Temple Mount is cross-posted on Israel Blogger. Bibi's latest, of a very long, long list, capitulation to dangerous and ridiculous Leftist pro-Arab terrorist demands was the removal of the recently set up metal detectors to the Temple Mount for Arabs. As Paula Stern aka A Soldier's Mother has complained on facebook, not only do Jews, Christians and whatevers have to undergo demeaning "inspections" to get to the Temple Mount, where we're forbidden prayers, but just to go to the Kotel we go through metal detectors and our possessions are xrayed. For those unfamiliar with the Old City of Jerusalem, the Kotel and Temple Mount, I'll explain a bit of the "geography." The Temple Mount is in the old walled City of Jerusalem. It's an "outer section." The "outer wall" of the Temple Mount is a section of the Old City Walls. The Kotel is a "support wall" of the Temple Mount, not the ancient Jewish Holy Temple, and an inner wall in the Old City. If you look at pre-1967 Six Days War photos you won't see anything like today's large impressive plaza. It was more like a narrow street where Jews gathered to pray by that wall. In recent decades, since the 1967 war, not only has the State of Israel removed buildings to allow for massive Jewish Prayer at the Kotel, but it installed security inspection machinery at all entrances to the plaza. Everyone goes through a personal metal detector and puts his/her bags through a special x-ray conveyor belt. That is just to get to the Kotel. Now, if you want to ascend the Temple Mount, you go through an additional, much more extensive security inspection. Your bags will be opened, checked and frequently held by the special security staff. Tourists, Jews, Christians and anyone else who doesn't seem to be an Arab Muslim can only enter through that gate. Muslim Arabs have other entrances to the Temple Mount which aren't from the Kotel area. That means that not only aren't they inspected before entering the Temple Mount, but they haven't gone passed through the metal detectors at the entrances to the Kotel. Yes, the Arabs can bring anything they want up to the Temple Mount, whether something as safe or innocuous as food or prayer books, but also guns, knives and explosives. The Israeli soldiers/police stationed at the Arab entrances have nothing to do other than being "window dressing" to make it look like there's some security. Their only real job is to keep the non-Muslims from entering. Non-Muslims may be able to bring food, though saying a prayer/blessing before eating may get you carted out. Prayers are forbidden, so we aren't allowed to have any prayer books with us on the Temple Mount. And of course, anything considered to be a weapon is forbidden. Remember that the bags are inspected besides personal metal detectors, rather reminiscent of airport security. Here's another very big difference between Muslims and non-Muslims on the Temple Mount. While Muslims can wander freely, all others are herded into groups which are supervised by "guides." These "guides" not only restrict where a visitor can go, but they constantly watch to prevent anyone from praying. Yes, I kid you not. For some totally fokokt reason, the Israeli Government has long agreed to the Wakf demand that there only be Islamic prayer on the Holiest Site for Jews. None of this makes sense. Does it? Why don't we have minimal Civil Rights or Religious Rights in the Holiest of Places? It's now less than a week until the 9th of Av when for millennia the Jewish People have mourned the loss and destruction of our Holy Temples. The time has come to stop mourning and start building the Third Holy Temple. Stage one is to be fully sovereign in The Land of Israel, the City of Jerusalem and on the Temple Mount! Bibi Melts Like Margarine on a Hot Day is cross-posted on Israel Blogger. "He's margarine and she's butter." I keep thinking of that runny, awful and unhealthy margarine, because Bibi again melted at Arab threats. I wouldn't insult "butter" by comparing our weak Prime Minister to it. "If you can't take the heat, get out of the kitchen." It's clear that Binyamin "Bibi" Netanyahu is just too weak. He can't take the heat. And the most depressing thing is that in all honesty, there isn't anyone in Israeli politics who seems any better. Nobody is willing to not only "tell the world off" for a "sound-bite," but to stick to a policy that's good for us when everyone is cursing, threatening and excusing Arab terrorism. A good, effective Israeli leader wouldn't rely on the "friendship" of any foreign power. A good, effective Israeli leader would only consider what's best for the State of Israel. A good, effective Israeli leader would not buckle/melt under Arab terrorist threats. "I'm not going. There's nobody to speak to אין עם מי לדבר Ain im mi lidaber. The Arabs are murderers! They show no readiness to make peace." But Shamir melted. He ignored the fact that a good Jewish bus driver and an innocent mother of seven had just been murdered by Arab terrorists. This past Friday night, on the Eve of the Sabbath a Jewish home was invaded by an Arab terrorist who murdered three members of a family, a father and two adult children. This was just a week after Arab terrorists on the Temple Mount had murdered two Israeli policemen. And now, the new metal detectors and security cameras at the Muslim entrances to the Temple Mount are bing removed. Prime Minister Binyamin Bibi Netanyahu can't be relied on. 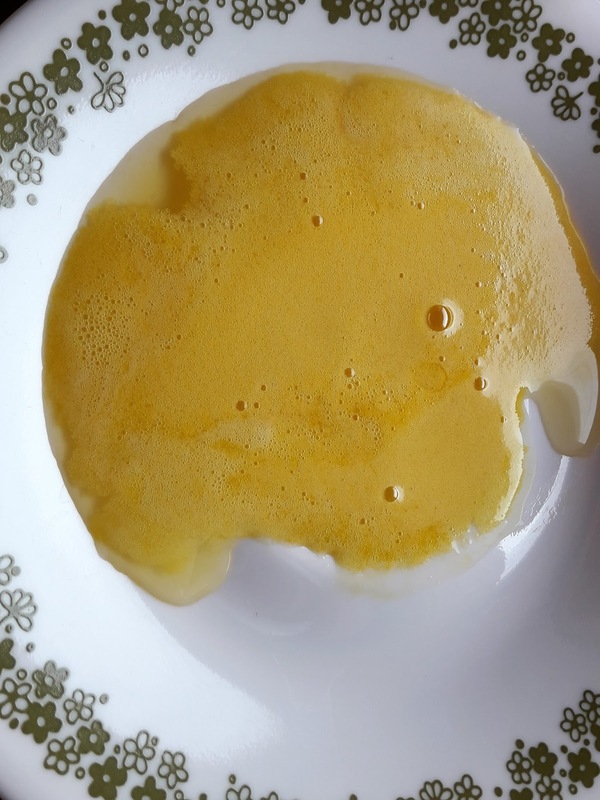 We're being ruled by mushy melting margarine. Must Keep Temple Mount Metal Detectors for Arabs is also posted on Israel Blogger. Now to make it clear to those who don't live in Israel or visit much. Metal detectors are all over, a normal part of life here in Israel. You go through them when entering most medical clinics, supermarkets, hospitals, universities, cinemas, theaters, malls and large stores. Men no longer use their trouser pockets as change purses, since even a few coins get the alarms ringing. Metal hairclips and even gold jewelry can do the same depending on the sensitivity setting of the security device. Jews, Arabs, tourists, yes, everyone is expected to be inspected. It's a fact of life here. We've become very skilled at effortlessly piling our bags, backpacks, phones etcetera on security tables to be opened and conveyor belts that take them for x-rays. Until a few days ago, the biggest exception to this rule was the Muslim-only entrances to the Temple Mount. While Jews and other non-Muslim tourists put up with very intensive security checks before ascending to the holy place, Moslems could just walk in with anything. Yes, that anything included weapons. Now, due to the murder of two Israel Policemen, davka Arab Druse, by Muslims on the Temple Mount, finally the Israeli security authorities have installed metal detectors for Arab Muslims who want to enter the Temple Mount. And of course, the Arabs are rioting and using that as yet another excuse for murderous terror attacks against innocent Jews. There is nothing at all to negotiate here. And there is absolutely no need for any foreigners to come to help mediate. The metal detectors must remain in place, and Arabs must undergo exactly the same security inspections as anybody else!! That's it, as far as I'm concerned. Do you agree? 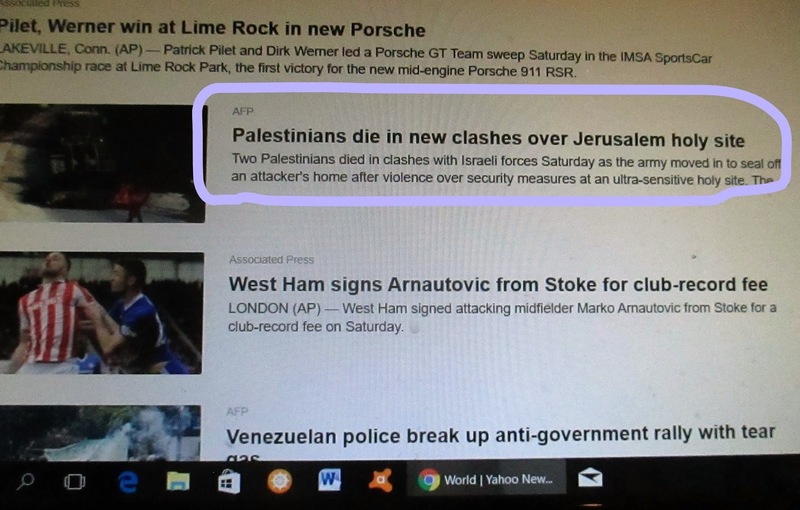 World Cares More for Terrorists Than Arab Terror's Jewish Victims was also posted on Israel Blogger. I was horrified, though not surprised, when I saw the totally inaccurate headlines featured on YahooNews. They gave a distorted, fokokt antisemitic version of the horrendously blood-thirsty Sabbath Eve attack on a family a few of miles west of here. In Neve Tzuf-Chalamish an Arab terrorist broke through the community security fence, entered a house and slaughtered innocent Jews. The headlines totally ignored the fact that Israel has been protecting its citizens from Arab terror attacks. You shouldn't think that it was easy to find these headlines. News about that horrific Sabbath Eve Arab terror attack on the Neve Tzuf family isn't considered newsworthy. The photos show how they're scattered between benign sports news and other innocent pursuits. The international media does not want its readers to know about the cruelty and inhumanity of Arab terrorism. 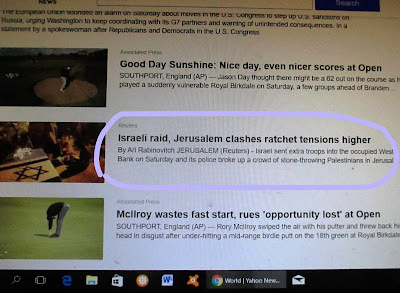 None of these headlines gives an accurate description, a factual summary of what happened in Neve Tzuf on Friday night. They are all written to give the impression that Israel is the aggressor and Arabs innocent victims. No doubt that if the so-called "Palestinians," sic had been actual victims they would have been more prominent. There is a well-planned international agenda to portray Israel as vicious aggressors. Therefore we shouldn't expect justice and accuracy from the media, nor from foreign governments and NGOs. None of them are interested in the truth. I join the Salomon Family and good people in Neve Tzuf mourning the terror victims and wish a refuah shleimah, complete and speedy recovery to the injured. Honestly, after hearing that more innocent Jews were murdered by Arab terrorists on Shabbat, I have nothing new to say. The terror attack took place in Neve Tzuf, which is also called Chalamish. It's southwest of Shiloh on the western side of our regional council Mateh Binyamin. An Arab terrorist managed to get over the security fence, enter a house and stab four Jews. Three of the innocent Jews died of their wounds and the fourth survived. One of the reports I read said that they managed to hide children from the terrorist. And a neighbor who heard screaming shot the terrorist through a window. I have no "inside news," and at this hour the identities of the victims haven't been announced. We Jews are now in the Three Weeks before the Fast of the 9th of Av which commemorate the invasion, conquest and destruction of Jerusalem and both Holy Temples. It's a very intense time in the Jewish Calendar and always occurs during the hottest time of the year. Considering how difficult it is to fast in the heat of the summer, it's easy to imagine the difficulties of the Jewish soldiers in Jerusalem and other battlegrounds, which don't have much of a water supply. It, also, doesn't rain in the summer. And after the enemy conquest over two thousand 2,000 years ago and resulting exile, the Land became a barren disease infested wasteland. So, you'd think that the Zionists would have rushed at the opportunity to temporarily substitute the beautiful and fertile part of Africa, known today as Uganda, which had been offered. That proposal was never accepted by the Zionist Congress, regardless of their secularism. I began thinking of it last night during the Shiloh Conference. I don't remember what the trigger was. My mind kept comparing it to the Hashemite Tribe taking up Great Britain's (illegal*) offer for inventing a country/Hashemite Kingdom sic in Transjordan. The Hashemite tribe had no problem at all accepting the offer from Great Britain and inventing a new country in a high percentage of the land which was supposed to be a Jewish State. Considering that there's no historic connection of the Hashemites to the eastern bank of the Jordan River, and that the land had been allocated to be a Jewish State by the League of Nations, we should be shocked that no country, to my knowledge, protested. As you can see, diplomatic antisemitism in't new at all. This also is a good example showing how the Muslim Arabs don't need a historic connection to a land in order to take over and claim it's theirs. *Transjordan was part of the Mandate which was intended for a Jewish State. GB kept doing everything it could to frustrate and handicap the establishment of a Jewish State. Academics, ideologues, political theorists, philosophers, sociologists etc. love to invent all sorts of benign and anti-Israel reasons for the Arab terrorism here. But there's a very simple reason, if you'd only "Follow The Money." It's no secret, and The Palestinian Media Watch's latest update should make it clear there's something to worry about. 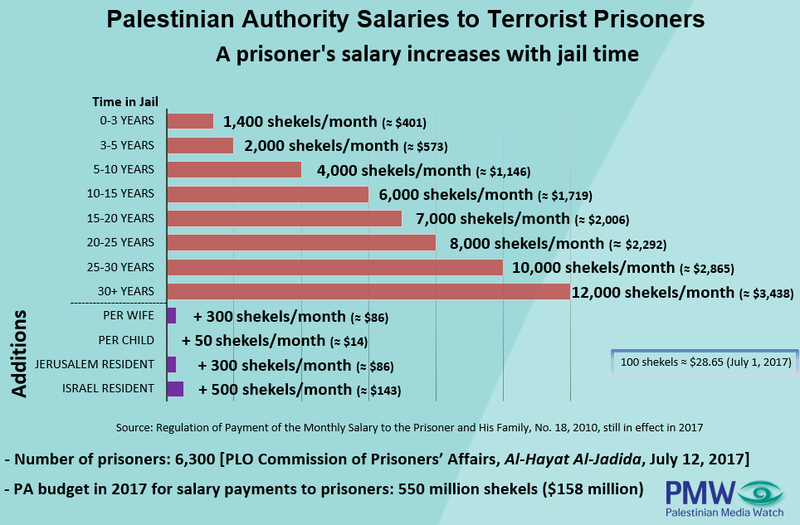 Yes, unfortunately, for many Arabs under Fatah and Hamas rule, it literally pays and pays well to be a terrorist. 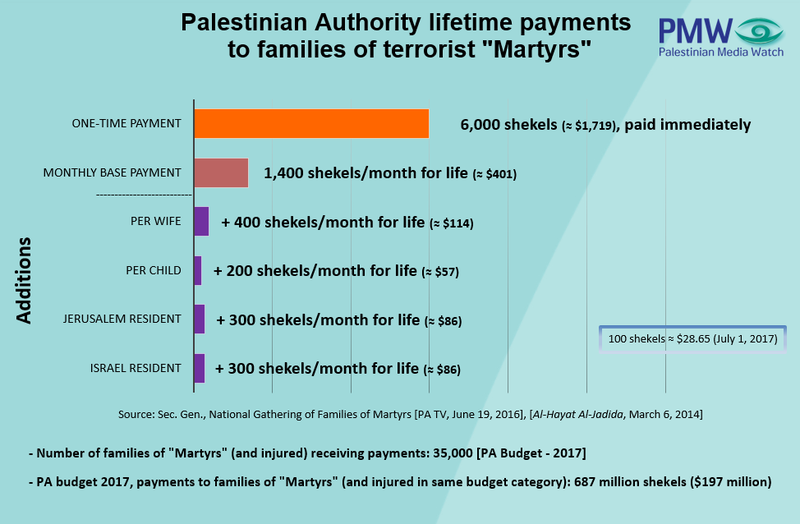 And for some of those who have Israeli citizenship or live in Jerusalem, especially those whose education was part of the Jordanian or PA Curriculums the PA "terrorist pension" seems like easy money. There's so much corruption in the Palestinian Authority-PA that legitimate job opportunities are few and far between. Some clans have succeeded in keeping away and getting jobs in Israeli businesses nearby, like Rami Levy. Remember that the money going into the terrorist pension fund comes from Europe, the United Nations, various NGOs, the United States and those people who think they are donating to peace, medical care and human rights. The truth is that they are giving financial support to terrorism and corruption. This is also posted on Israel Blogger. Ever since Arab terrorism had become one of the "expected" dangers of Israeli life, we've all gotten used to the fact that all public buildings, malls and some businesses require passing through metal detectors. In addition many other places of business or offices have some sort of guard screening those entering. That's besides the super-thorough security in airports all over the world, which have made wearing "money-belts" illegal. Here in Israel, most of us don't even think about it. We just automatically empty our pockets of keys, cellphone, put our pocketbooks, backpacks etc on the table for the guard to check as we go through the metal detectors. It was totally clear to me that the discrimination against Jews was not only immoral, but it was totally illogical. Now, after the latest rioting, metal detectors have been set up at the Arab entrances to the Temple Mount. Yes, Jews are allowed one crowded entry point, while Arabs can enter from a few different entrances. Yes, that's more anti-Jewish (and Christian) discrimination. Of course, the Arabs are protesting. I hope and pray that the State of Israel won't back down on this. I also hope and pray that Jews will be given full religious and civil rights on The Temple Mount. It's time that we be allowed to pray in our Holiest Site in the World. 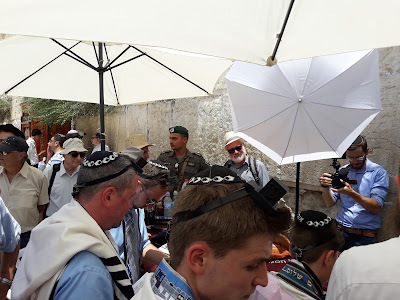 Regardless of the strong sun and heat at the time we attended a Bar Mitzvah at the Kotel yesterday, all was so peaceful when we were there. We even rushed down via the Arab shuq, which my husband generally takes, and not either of my two favorite ways. I didn't feel or notice any tension in the air, even though according to the news there was a lot of Arab violence not far from where we were. 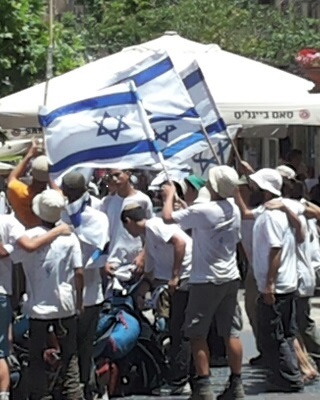 Instead of riots there was more a carnival-like atmosphere, especially due to the Maccabiah athletes of all ages from all over the world who were gathering at the Kotel for prayers, dancing and singing. As you can see, there are also handicapped/special athletes who compete in Maccabiah sports events. One man leaned over the mechitza/divider to photograph his daughter. I asked which of them had completed, and he answered that both he and his daughter were Maccabiah athletes. Women courteously accepted the shawls, scarves and wrap-around skirts offered by the soft-speaking polite women who offered them and then told them to keep them on until close to the exit where they could be returned. It was clear that some were even grateful for the protection against the strong summer sunlight which was terribly hard to escape and avoid at high noon. Yes, contrary to the impression you get from the news, the Kotel has a nice atmosphere. I felt no tension or resentment at all. And there is an egalitarian section, which is perfectly open, for those who want. Contrary to the Principles I learned when taking a Life Coaching course, when it comes to the problems in security, standing and sovereignty the State of Israel is suffering, I think that the key to solving it all is to go to the biggest issue. That is the Status of the Temple Mount, Har Habayit, the location of Judaism's two Holy Temples and the Holiest Place in the World for the Jewish People. The past two Shabbatot we read of the story of Pinchas and how he executed Kosbi and Zimra on the spot as they were sinning publicly against Gd. We must not judge his actions on modern western values/philosophy only only on Torah Law and "What's good for the Jews." Davka, just hours before Shabbat Pinchas there was a terrible, though predictable Arab terror attack on the Temple Mount. Arab Muslim terrorists, who aren't inspected before entering the holiest of places, murdered Israeli Policemen. The State of Israel finally had the gumption to close the Temple Mount to Arabs, but just for a couple of days. It has already been reopened, although with additional security checks. 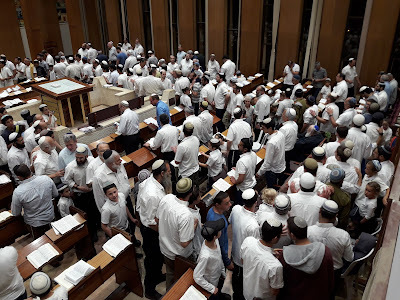 The Israeli Government should have used this tragic attack to finally take away the rule of the Wakf and allow a Jewish group to administer the area. In the process all of the restrictions on Jews and Jewish Worship must end. This is our Holiest Site, and giving it to the Moslems is a chilul Hashem, a disgraceful act insulting Gd. Gd willing we will soon have leaders here who are worthy of Pinchas's heritage. to gather in Lisbon, and from there to be sent into exile by ship. It was a mean, cruel trick. of a life of luxury and ease [if they would convert to Christianity]. To their eternal credit, no one accepted the offer.